It has already been a busy couple of months for the Club, your Board of Directors have been hard at work planning and organizing events, meetings and shows for the upcoming year. We had a very successful Tracking Test, with 5 GSD’s entered and all 5 finding the glove! The Judges were awesome and wonderful to work with, Rosi VonFintel our Chief Tracklayer had everyone organized and on time, and Sally Hamm as always had the rest of the responsibilities to put on a big test like this well under control. To put on events such as a Tracking Test, Conformation Shows and Obedience Trials takes dedicated members. None of this is rocket science but there are certain steps and processes that need to be followed to stay in compliance with the AKC. The goal the Board has this year is to cross train several of our members who are willing to take on some of these leadership responsibilities. Currently, those responsibilities have been done by the same people for many years now, we hope some of the newer members will learn and take over tasks that are essential for this club. One of these tasks is taking on the key positions to do the Tracking Test, consisting of Chief Tracklayer, Tracking Chair and Secretary. As many of you know, the board has been discussing the fate of the Tracking Test. There are multiple club members that are actively tracking and hopefully we will get a commitment from them to learn the tasks for those positions needed to keep this Test going. The Board is not taking this lightly and this will be put to a membership vote in May. So, if you love tracking and want to ensure the club putting on an annual test, please volunteer to take this on! It was great to vote in a new member and have two more membership applications read in February, I think our club is continuing to grow and reach out to our community. We will be having classes in the park again this year and look forward to meeting more dog owners wishing to learn how to have a well behaved canine good citizen! I look forward to seeing everyone at our March club meeting at the Community Center at Macken Park. Volunteering is a vital part of any grassroots team. As well as being essential for the sustainability and longevity of our club, volunteers can bring additional ideas and knowledge to the table. Please consider signing up to assist with the Bone-Anza event on April 13th. EASTER EGG HUNT FOR DOGS ! ! ! Has your German Shepherd ever experienced the joy of an Easter Egg Hunt? Now’s your chance to treat your dog and support your local GSD club! Participation at this event offsets our building rental cost! Come volunteer at this fun event! Volunteers needed for setup, tear down, info table, ring work! Show off your darling’s skills! Obedience, Rally, Tricks of all kinds! Don’t miss this opportunity to show the world how great GSD’s are!!!!! Sign-up sheet will be available during the March & April club meetings. Contact JoClair Gipe (jclair@gsdcgkc.com) with any questions. Bobbie Schiffelbein, Betty Johnson and Chris Kimerer have the pleasure to announce their new Champion, BIM Ch. Charbo’s Music of the Night at Tintagel v Jalyn. With very limited showing our girl, Muse never disappointed us in the ring, going Best in Maturity in the Midwest region, taking back-to-back 4 point majors with a Best of Breed over several very nice specials, another 4 point major, placing 4th in a big quality filled American Bred class at the National and now finishing in style with another Best of Breed win over specials at a 3 point major show, topping it all off with a Group 4 placement. Handled exclusively by Diana Paul and Tiffany Bartley, Muse was always in impeccable condition thanks to Milestone K9 management! Muse now makes the 5th Champion for Bobbie Schiffelbein and Lynette Stone, all out of their beautiful ROM girl, Razzy and Bobbie & Charlie Schiffelbein’s ever so handsome Ch. Colt 45. 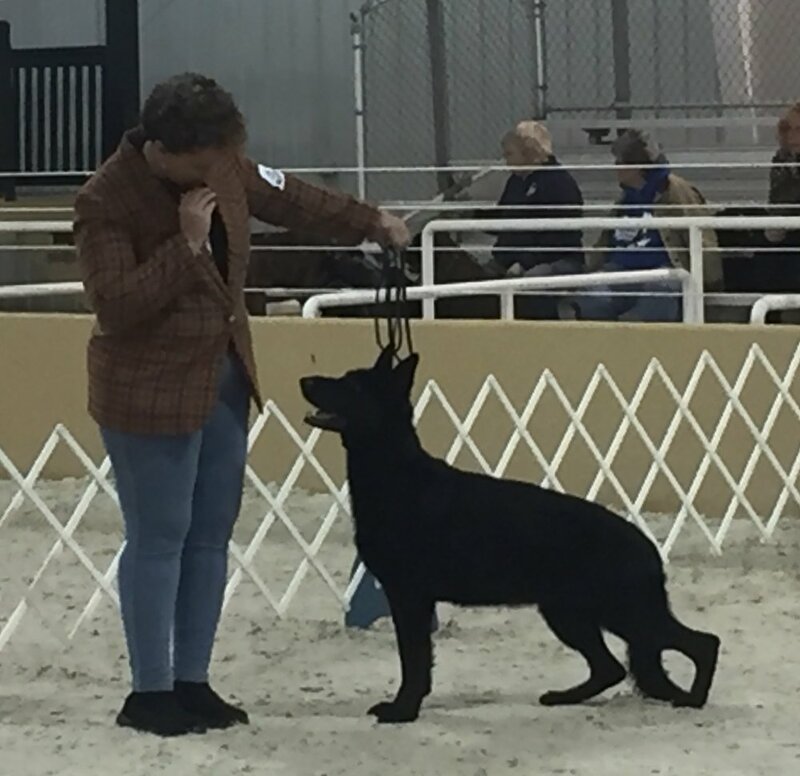 Tammy Peterson and her GSD, Zoey, and Becky James and her GSD, Freya, have been invited to attend the AKC Rally National Championship being held on March 15,2019 in Tulsa, Oklahoma. We're proud of Tammy and Becky for their dedication as handler's and their talented dogs. Let's cheer them on as they prepare for the event. JoClair Gipe, is overwhelmed with joy on the arrival of her new puppy, a male black and red long coat from Becky James’ Stoick’s litter. The puppy, von Darkwing is eight weeks old and weighs 20 pounds. JoClair and Jerry have yet to decide on a call name. Daddy, Stoick is pictured below. Congratulations to JoClair and Jerry! The GSDCGKC is pleased to welcome Billie Good as a new member of the Club. Billie resides in Topeka, Kansas and has an 11-month old puppy. Take time to introduce yourself to Billie and welcome her to the club. “I’d Like to Volunteer” Looking for ways to become involved? As a volunteer, you are the lifeblood of the German Shepherd Dog Club of Greater Kansas City. We cannot accomplish our goals without the participation of volunteers. The club has successfully offered the (TD/TDX) Tracking Test for several years using the same group of volunteers' year-after-year. It is time to pass the torch to some new people. Filling a leadership role as the Chairperson is a great way to gain tracking experience, expand your knowledge of AKC requirements, connect with others in the club, and establish life long friendships. The club is seeking someone to come forward and volunteer to serve as the Chairperson in order to continue offering the tracking event. The Board of Directors will be personally reaching out to members to step up to the challenge. If anyone is interested in serving as the Chairman or helping in another capacity, please contact Chris Kimerer or any Board member. Regulation: European German Shepherds are regulated under the SV (German Shepherd Club of Germany), which gives each and every registered dog the seal of approval. Physical Characteristics: Physically, European German Shepherds have bigger heads, a straighter line on their hind legs, and a shorter and wider back-line. Traits: European German Shepherds are believed to be better suited as working dogs than their American counterparts. Because of this, it's also believed that they make better guard dogs. The majority of police dogs are from European lines. This may be due to the fact that the SV has worked hard at preserving the working temperament of German Shepherds for many years. Regulation: American German Shepherds may participate in competitions under the American Kennel Club; however, these dogs don't have as many regulations as their European counterparts. Physical Characteristics: Although they are a bit bigger overall than European German Shepherds, they have a more refined head, their hind legs bend more, and their torso is more angled from front to back. Traits: American German Shepherds are known for being elegant, having a graceful walk, and for their extraordinary performance in the show ring. Which German Shepherd is right for you, the American or the European? That's something only you can answer. But if you're a German Shepherd lover, we're sure you'll find something to love in both varieties. Meeting was called to order by Debbie McHenry at 6:05. All board members were present. Troy Edwards was a guest. Sally Hamm read last month’s minutes and they were approved. Mike Kennedy reported no changes to the Treasurer’s report since last board meeting and they were approved. Amy Edwards reported that she had received final closing for the tracking trial from the AKC. Chris Kimerer said the AKC has approved the June Conformation Shows. Sally Hamm reported that the Obedience Trial was submitted for approval and we had received the Judges contract. Chris also reported that the Tracking test was closed. Smithville Parks Director was discussing with us a move to a different field and not using a shelter house for the June shows in Smithville. Sally and Chris will meet with him and finish the details with the Director in the next weeks. There was a discussion about Social Media’s role for the club and that it was not to be used for personal advertising. The club has a breeder referral member and it does not want to get involved in the sales of GSD’s. The board then discussed the needs to update its control administrators of social media by updating our policy and procedures. A committee needs to be updated for this business which got delayed last year. Chris moved that: Only members of the current Board of Directors or those appointed by the current Board, can be master administrators of our social media. JoClair seconded. Motion unanimously passed. JoClair discussed and distributed a flyer for the upcoming Bone-Anza for NKC park on April 13th and passed a sign-up sheet for volunteers between 1 and 2:30. It will also be discussed at the regular meeting. JoClair also discussed possible awards requirements for plaques presented by the club as members would need to volunteer for 2 club duties. Debbie suggested that if this is the case than there needs to be a form and someone would need to be assigned to keep track of this information. It was decided to table this discussion until the next meeting. There was also a discussion about pushing the board meeting 15-30 minutes earlier if needed to allow the board to complete its business. Chris moved to adjourn at 6:48. Presentation given by Dr. Keenan Massey of Hoof n Paw Animal Chiropractic at 7:00 at the Community Building at Macken Park in N. Kansas City. Dinner was provided by Betty and Ray Laughlin and Tracking celebration cakes by other members. Chris Kimerer called the meeting to order at 7:55. Sally Hamm read the minutes of the last meeting. Mike Kennedy made a motion to accept the minutes as read Bruce Hudson 2nd, motion passed. Mike then read the Treasurer’s report: 8625.58 in checking, 28,656.57 in CD for a total of 37,282.15., Sally made a motion to accept them as read, Betty 2nd, motion passed. Debbie McHenry talked about the Tails and Treats in the Park as being a 6-week beginner class starting on April 18 from 6:30 to 7:30, which will be open to residents of N. Kansas City as well as club members. Fees will be $50 for members and $60 for nonmembers. There will be a CGC offered at our June shows for those who wish to try for that title after the course and open to anyone who is ready. Chris discussed that the June Specialty is underway and accepted by the AKC with a slight shift of fields in Smiths Fork Park. Sally mentioned that the July Obedience Trials have a judge and have been applied for with the AKC. Sally also talked about a board recommendation to drop the January Tracking trials unless someone is willing to step up to take over the leadership positions the current leaders have been doing it for a long time. A vote on whether members would like to continue the trials will be held at the May meeting. This will give time to those wanting to take over time to find judges and learn how to apply to AKC within the required time frame. Chairperson duties will be found in the newsletter. Both Matt Orf and Jose and Dollie Lemus applied for new membership and had their first readings. Billie Good from Topeka with an 11-month puppy had her second reading and was voted into membership. Pat Robinette and Ruger passed their TD at our tracking trial last month. Megan Marmon and Aaron Stasiale’s dog, Eero certified for their tracking title. JoClair Gipe is looking forward to a new puppy from Becky James’s Stoick. Chris Kimerer’s dog Muse completed her championship. March and April will have programs planned by the board here in the Community building. May’s program will be in the shelter house across the street. Due to the June Specialty there will be no June meeting. July’s meeting will also be in the shelter house with an ice cream social, August’s meeting will include a dog walk through the park. September’s meeting will be the club’s picnic. Bruce Hudson is in charge and would love some help. October will not have a regular meeting because of the National dog show but we will be sponsoring a booth in Howl-o-Ween in the park for North Kansas City. More information about time and needs will be coming. November will be our annual Thanksgiving dinner and December will be our annual awards banquet. The specifics for these events will be on club’s website and also in the newsletters. Debbie provided raffle items from Steve’s dehydrated raw food. See the results from the Tracking event and many great pictures. See photos of the Awards Luncheon. Remembering our beloved member, Susan Hunt, read more. See what our members did at the Nationals. Also pictures from the Fall Dinner. Check out the photos from the annual picnic. Fun reading! The August newsletter includes highlights and photos of the Dock Diving Event. Check out our Featured Member, Pat Robinette. Check out Photos from the Obedience Show hosted by the GSDCGKC. Welcome our newest members; Tammy Peterson and Heather Culbreth. Don’t miss the June Newsletter. Lots of fun photos from the Specialty Show and Midwest Futurity/Maturity. Check out the photos from the Ice Cream Social and showing off our best dog trick.